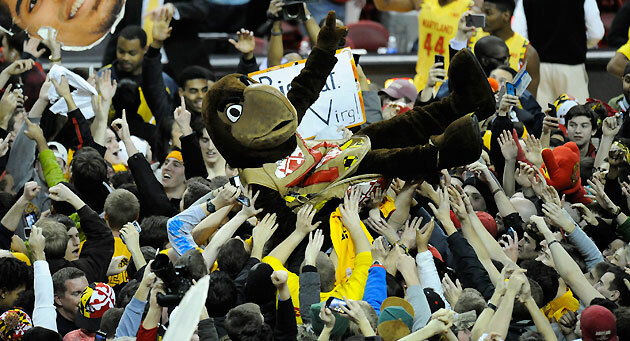 Is it time to ban court storming in college basketball? Who is the nation's best point guard? Seth Davis answers these questions in his mailbag. Less than 24 hours after Monday's unsettling scene which unfolded during a court storm at Kansas State, the security team at the University of Maryland’s Comcast Center showed admirable foresight. As soon as the buzzer sounded on Maryland’s win over Wisconsin, the guards quickly moved into place to keep the fans away from players and coaches. That was trumpeted as evidence that it’s O.K. for court storms to continue, provided the proper precautions are taken. Except it’s not O.K. As long as fans are permitted to run onto the floor after a game, the potential for injury and confrontation will persist. The only way to manage them is to get rid of them, once and for all. As should be obvious by now, these storms are dangerous. Yes, the vast majority take place without anyone getting hurt, but there have been enough exceptions to warrant eliminating them. The most notorious is the case of Joe Kay, a high school basketball player in Tucson, Arizona, who was left paralyzed on one side of his body because of an on-court celebration that occurred in 2004. That same year, Gerry Plunkett, the wife of former NFL quarterback Jim Plunkett, had trouble breathing because she was pinned under her chair during a court storm at Stanford. In 2011, a female fan tore tendons in her ankle during a storm at Indiana following the Hoosiers’ win over Kentucky. Two years ago, N.C. State forward C.J. Leslie had to rescue a male student who was confined in a wheelchair but had ended up in the middle of a courtstorm because a fellow student had wheeled him into the fray. When the chair tipped over, Leslie had to reach down and pull the young man off the ground. These incidents are a lot more common than you realize. Talk to any coach or referee, and there’s a good chance he has a harrowing tale about getting caught in a mob. The possibility for an ugly confrontation is only going to get likelier as well. We saw a pretty bad one take place last season at Utah Valley following the team’s win over New Mexico State. The visiting players squared off with a few fans, and if it weren’t for the heady actions of a New Mexico State assistant coach, the confrontation could have escalated quickly. I still don’t know how KU forward Jamari Traylor restrained himself when a young Kansas State fan intentionally plowed into him on Monday night. Next time, the fan won’t be so lucky. Those who say they want court storms to continue usually fall back on two specious arguments. The first is that the storms are a part of the game’s tradition. But that is not true. Court storms are a relatively recent phenomenon, proliferated mostly by television. A few minutes before that court storm at Kansas State, ESPN showed a montage of other storms that had taken place in Bramlage. Most every time a storm takes place, it is featured in a SportsCenter highlight. That’s not covering the news, that’s promoting the chance for fans to rush the court and get on television. Then there’s the old saw, “Hey, they’re college kids! Let 'em have fun!” To which I reply, if fans can’t have fun watching the home team win an exciting game from the luxury of their seats, they don’t belong in the building. How many paralyzed fans or ugly brawls would it take to bring people around to the realization that it’s time to ban court storms? Is one enough? Is five? Do I hear 10? Just tell me the number, because it’s only a matter of time until we reach it. As you may know, I’ve been railing against court storms for a while now, and every time I do I get the predictable get-off-my-lawn mockery. Fair enough. If this makes me a fuddy duddy, I welcome the label. Because in the end, what a court storm demonstrates most of all is a sense of entitlement and a lack of respect. I think those lines around the court are sacred. The players, the coaches and the referees have earned the right to be inside them. The rest of us haven’t. The idea that a fan doesn’t just have the option but the right to storm the court is repulsive to me. And in our increasingly coarsened society, those fans often carry the mindset that they can do and say whatever they want. Plowing into an opposing player is no different than writing something obnoxious to him over Twitter. Hey, it’s just part of the game, right? In the wake of the incident at Kansas State, Big 12 commissioner Bob Bowlsby issued a statement saying he hoped that it “should be a call to action for all of us.” That call is coming too late, but at least it's here. Let’s ban these court storms once and for all. The game is too good to let it get spoiled like this. 1. Jerian Grant, 6’5” senior, Notre Dame. Has the best combination of scoring, setting up his teammates and playing D of any point guard in the country. Ranks first in the ACC in both assists (6.6) and assist-to-turnover ratio (3.29) while also ranking fifth in points (16.9), fifth in steals (1.8) and 11th in free throw percentage (76.5). 2. Delon Wright, 6’5” senior, Utah. 3. T.J. McConnell, 6’1” senior, Arizona. His three-point shooting is down for the second straight season, but he is a better all-around player and leader. He's second in the Pac-12 in assist-to-turnover ratio (3.06), ranks second in assists (6.0) and steals (2.2) while averaging 9.9 points per game. 4. Melo Trimble, 6’2” freshman, Maryland. Had a rough first half of the Big Ten season, but for the most part has done a great job running this team in his first college season. He leads the team in points (16.1) and steals (1.37), but his best asset is his ability to get to the free throw line, where he converts a Big Ten-best 87.1%. 5. Monte Morris, 6’2” sophomore, Iowa State. Not much of a scorer, but he leads the nation with a 4.55 assist-to-turnover ratio. He’s also first in the Big 12 in assists (5.4) and fourth in steals (1.73). 6. Tyus Jones, 6’1” freshman, Duke. The ACC’s best free throw shooter (87.4%) also ranks second in the league in assists (5.7), fourth in assist-to-turnover ratio (2.88) and eighth in steals (1.4). Showed off his clutch gene while making big shots in three of Duke’s biggest wins (at Wisconsin, at Virginia, vs. North Carolina). 7. Fred VanVleet, 6’0” junior, Wichita State. Shooting percentages are a little down from last season because he has taken on more scoring responsibility, but still averaging a career-high 12.4 points per game. Ranks first in the Missouri Valley in assists (5.3) and assist-to-turnover ratio (3.24). Also second in the league steals (1.81) and sixth in free throw percentage (79.1). 8. Kris Dunn, 6’3” sophomore, Providence. Has had terrific season after losing two years to injuries. Leads the Big East in assists (7.4) and steals (2.8), and ranks second in field goal percentage (48.2), sixth in scoring (15.1) and eighth in assist-to-turnover ratio (1.72). 9. Kevin Pangos, 6’2” senior, Gonzaga. 10. Cameron Payne, 6’2” sophomore, Murray State. Was inexplicably left off the list of finalists for the Cousy Award, but has had a stellar season. Leads the Ohio Valley Conference in points (19.7), assists (5.8) and assist-to-turnover ratio (2.4), while ranking third in steals (2.0), fifth in free throw percentage (79.1) and eighth in field goal percentage (46.9). This is something I probably should have mentioned in my Hoop Thoughts column that dispelled seven selection myths, but the answer is yes, it is. There is not a single metric in the basketball universe that doesn’t come under consideration. That includes Ken Pomeroy’s efficiency ratings, Jeff Sagarin’s ratings, the BPI, and everything else. This must come as a disappointment to the conspiracy analytics folks who think that the RPI dominates to the exclusion of all else. Still, I'd like to channel my inner Charles Barkley here and say that all these rankings lose their usefulness after a while. If a committee member wants to go back and peruse the numbers as a check against how he or she is voting, then fine, but I don’t believe any of them could dramatically change that person’s opinion. And I am especially against the argument that the NCAA’s official algorithm should factor in margin of victory, which the Sagarin ratings does. That would incentivize coaches to pad their leads in the closing minutes of games. Do we really want that? Again, any individual committee person can take into account margin of victory. If he sees one game with a 30-point difference and another with a four-point difference, that might tell him something. But I am opposed to giving this too much weight. A win or a loss counts the same in the standings, regardless of the point spread. The selection process should reflect that logic. Ah yes, that’s exactly what Kentucky needs—another weapon. While I have no doubt that Wiltjer would be a much improved player than he was two years ago, I also have a hard time believing he would have anything approaching the season is having at Gonzaga had he stayed in Lexington. He is a tough match-up and a terrific long-range shooter, but do you really think he would have gotten more minutes at Kentucky last season than James Young or Julius Randle? Or that he would be getting more shots this season than Karl-Anthony Towns or Devin Booker? Normally, I’d argue that a team can’t have enough good players, but the last thing John Calipari needs is another high-level player to shoehorn into the mix. I would twist this question to address the recent uptick in transfers in college basketball. Every year, more and more players leave one school to find another, which is inevitably followed by the complaints of people (read: coaches) who decry the trend. I, too, wish young people who would suffer through adversity a little more, but for the most part, I don’t see anything wrong with this. Wiltjer is a perfect example. He could have gone to Gonzaga straight out of high school (the first time I ever saw Wiltjer play, I was sitting with Mark Few at a grassroots tournament in Las Vegas), but he chose to take his shot at Kentucky. He had his moments on the court during those two seasons in Lexington, but mostly he got better going up against top competition in practice. He saw the way Calipari was recruiting and figured that if he wanted to get more playing time, he had better head elsewhere. He took a year off to get better and stronger, and now he is having an All-America caliber season. It’s a great example of a win-win-win situation that was created by a transfer. That’s how things are supposed to work. It’s hard not to like a guy who tweets at halftime of his own games. In fact, Miles tweeted out his angst over his team’s performance in the first half of a 74-46 loss at home to Iowa on Sunday afternoon. It was after that game that he issued his edict that the players would no longer have access to their lavish $18.7 million practice facility. Although, given the way the team played, don’t you think the last thing Miles would want to do is prevent them from practicing? This is actually a fairly common motivational tactic, but often times it happens more in private. When Miles went into that postgame press conference and announced to the world his intentions, it felt more like grandstanding. It also felt too little too late, given that the Cornhuskers are one of the most disappointing teams in the country this season. I'm also instinctively suspicious when a coach throws his players under the bus in such a public way. After all, isn't the coach responsible for the debacle as well? If the players don’t have access to their carpeted locker room, then maybe the coach shouldn’t have access to his expansive office, either. I’m sure the school can find Miles a nice little cubicle somewhere.